Bruges to Amsterdam . . .
You can easily travel from Bruges to Amsterdam by train in as little as 2 hours 44 minutes with departures every hour or so and fares from just €30. Train is the safe & comfortable way to go! If you're going in the Amsterdam to Bruges direction, click here. 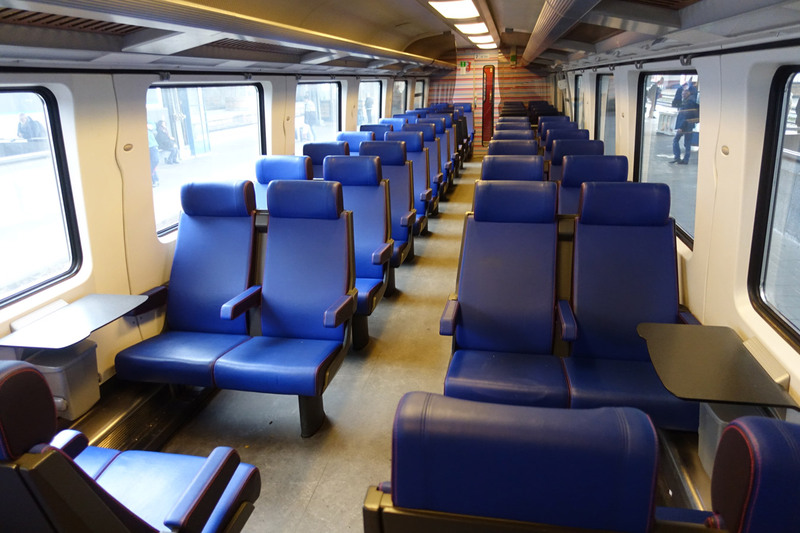 This is the site to use for Bruges-Amsterdam tickets because it's the official Belgian Railways international website, there is no mark-up or booking fee, it readily accepts international credit cards, and you can simply print your own ticket. You can use it wherever you live. 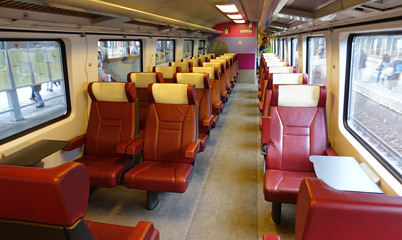 Option 1, IC train Bruges to Ghent, IC train Ghent to Antwerp, high-speed Thalys Antwerp to Amsterdam. Takes 2h44, 2 changes. 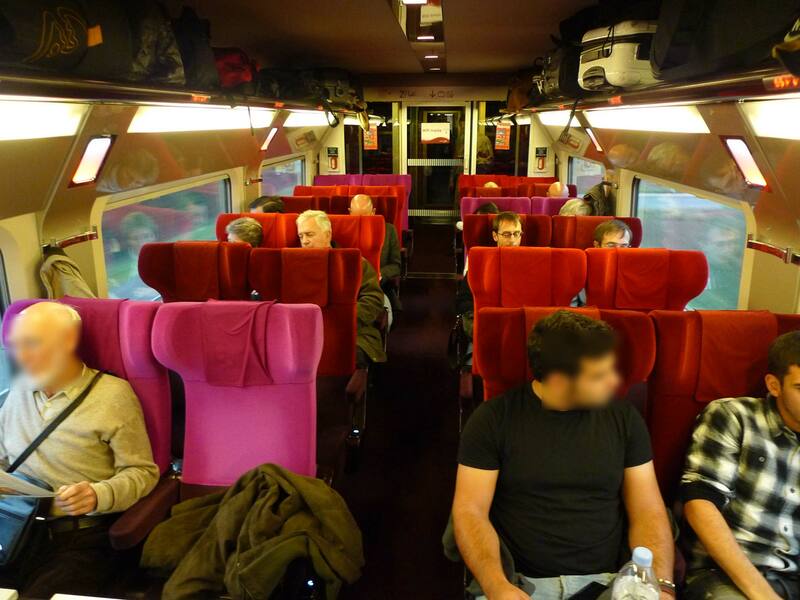 Option 2, IC train from Bruges to Brussels, high-speed Thalys train from Brussels to Amsterdam. Takes 3h11, but only 1 change. Option 3, IC train Bruges to Ghent, IC train Ghent to Antwerp, IC train from Antwerp to Amsterdam. Takes 3h39, 2 changes. Option 4, IC train from Bruges to Brussels, IC train from Brussels to Amsterdam. Takes 4h06, but only 1 change. Let's assume you know your travel dates and are happy to book ahead and commit. I recommend the following variation of option 1 with 1 unhurried change in Antwerp, total journey time 3h17. It's the most relaxed & comfortable option, and a fast one even if not the fastest. By default, www.b-europe.com always suggests the fastest option, which is to take an IC train from Bruges to Ghent, make a rushed 7 minute connection onto another IC from Ghent to Antwerp then make a tight 6 minute connection onto a fast & comfortable Thalys to Amsterdam Centraal. But fastest isn't always best. Wouldn't you prefer just one change of train, and an unhurried connection? So instead, I recommend leaving Bruges half an hour earlier on the hourly direct IC train from Bruges to Antwerp so there's no need to change in Ghent. 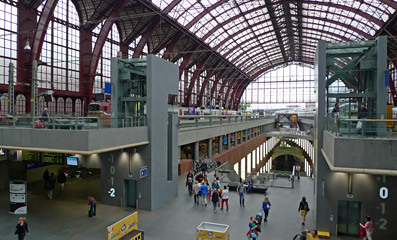 In Antwerp you now have one robust and unhurried 36-minute connection into the Thalys with time for a coffee or a beer and a look around one of Europe's most beautiful stations. Sounds good? (1) Click Advanced search and enter Bruges to Amsterdam Centraal. You'll now see Bruges to Amsterdam departures every hour or two marked IC, Thalys with 1 change at Antwerp. 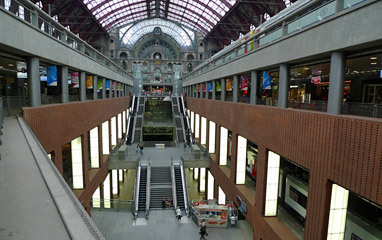 The direct trains from Bruges to Antwerp run every hour and arrive at Antwerp Central platforms 1-4 on the upper level. 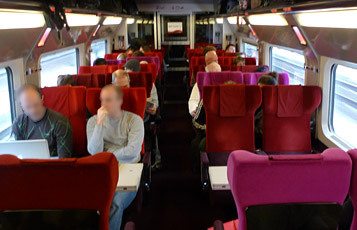 The Thalys to Amsterdam leaves from platform 22 on the lowest level, reached down escalators or lifts. See the photos of Antwerp station below. For a coffee I suggest the incredible Royal Cafe in Antwerp Central's main hall, a stone's throw from the platform where the train from Bruges arrives. In fact, why not catch the previous hour's Bruges-Antwerp IC train so you've time for some cake as well? Or you can leave even earlier to explore Antwerp old town for a few hours, as your ticket is good for any Bruges-Antwerp IC train that day, not just the one the website suggests. Just remember that from Antwerp to Amsterdam it's only good for the specific Thalys you book. The city hall is a 21 minute walk from the station, see map of Antwerp & directions. When you reach Amsterdam, you'll need your ticket to exit through the ticket gates at Amsterdam - the barcode will operate the gates. 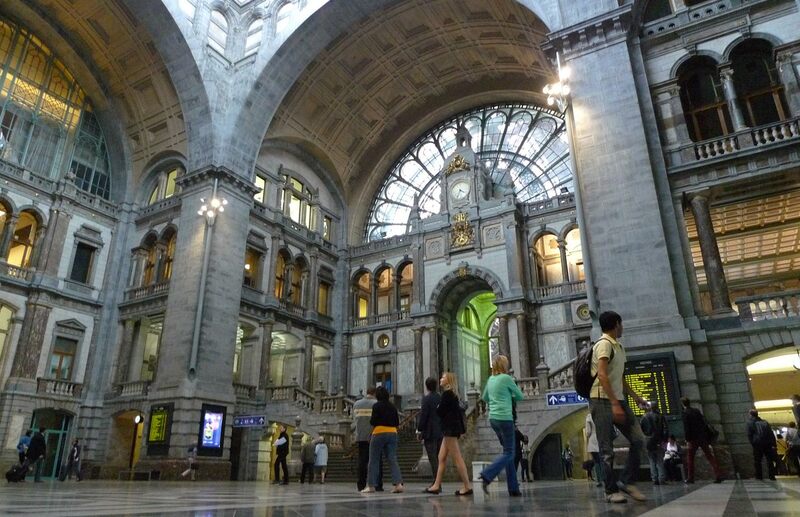 See the Amsterdam Central station guide. The Brussels-Antwerp-Amsterdam IC trains are comfortable enough, though not as comfy as Thalys and there's no WiFi or catering so bring your own food & drink. There are no seat reservations, you sit where you like. There are power sockets in 1st class, but not in 2nd. 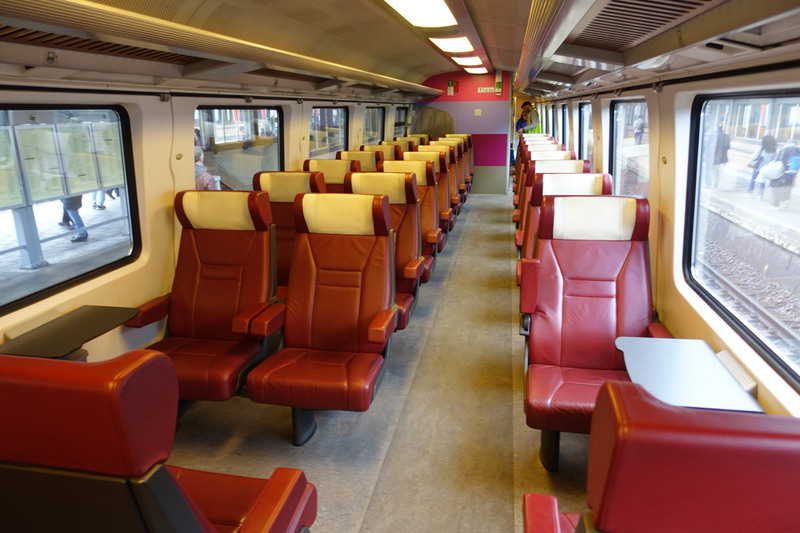 These IC trains now use the high-speed line between Amsterdam & Antwerp, but only at up to 160 km/h (100 mph) and they make more stops so they're slower than Thalys. But they're much more flexible as tickets are good for any IC train that day (miss one, catch the next one!) and you can stop off to see Antwerp or Rotterdam for a few hours if you like. 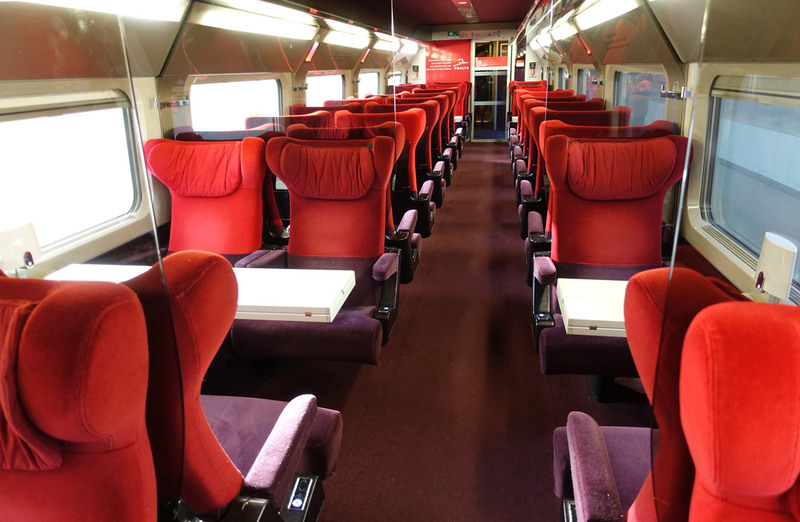 Tickets are affordable even on the day and the regular fare cannot sell out, so there's no need to nail your plans to the floor months in advance as with Thalys. If you buy a Bruges to Amsterdam ticket for options 1 or 3 including my recommended option, you change trains in Antwerp. 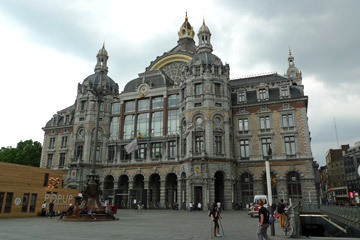 Antwerp Central is one of Europe's most beautiful stations, see https://en.wikipedia.org/wiki/Antwerpen-Centraal_railway_station. It's also a shining example of how to combine a historic station with extra platforms, extra retail and new high-speed tracks running underground. Antwerp central was originally a terminus with one level of dead-end tracks, now platforms 1-4 one floor above street level. There's now a retail level below (at street level), then another lower level of platforms (11-14), another mezzanine floor and then a third and lowest level of platforms (21-24) which are on the lines running across Antwerp in a tunnel. When these lines were built it took away the need for Paris - Brussels - Amsterdam trains to reverse (change direction) in Antwerp's dead-end platforms. A vast atrium brings natural light down to the lowest platforms, with lifts and escalators linking all the levels. When you travel from Bruges to Amsterdam, your train from Bruges arrives in the original terminus level, platforms 1-4. The onward trains to Amsterdam leave from platform 22 on the lowest level. A few minutes between trains is sufficient, as all you're doing is stepping off one train, walk to the other and step on. But it's really worth taking the time to have a look around! If you book a ticket for options 2 or 4 via Brussels, your ticket will be good for any IC train from Bruges to Brussels that day, not just the one the booking system suggests (which will no doubt involve a tight connection in Brussels). So by all means take an earlier one and have a less hurried connection, or even spend a few hours exploring Brussels if you like. 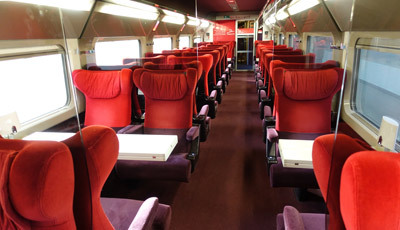 However, if you are using Thalys your ticket is only good for the specific Thalys you book on the the Brussels to Amsterdam part of the journey. If you're using an IC train from Brussels to Amsterdam, it's also good for any IC train that day.